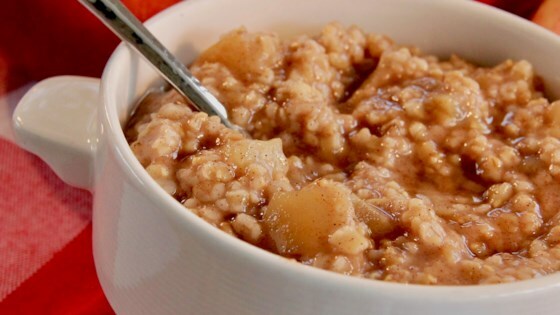 "Oatmeal made in the Instant Pot® with apples, apple pie spices, and steel-cut oats. Serve with your favorite toppings - we added pecans, a little almond milk, and a drizzle of maple syrup." Combine water, oats, apple, cinnamon, salt, and nutmeg in a multi-functional pressure cooker (such as Instant Pot(R)). Close and lock the lid. Seal vent. Select Manual function; set timer for 5 minutes. Allow 10 to 15 minutes for pressure to build. Release pressure using the natural-release method according to manufacturer's instructions, about 10 minutes. Release remaining pressure naturally. Stir and remove pot carefully with oven mitts. This tasted great, but I used the same amount of liquid and oats as the recipe states, and jt burned in my instant pot. I was still able to eat it though. I’m not sure why I had that issue.